Oils are fantastic. They are so multifunctional, you can use them for a whole variety of things. I would go in depth with them now, but admittedly I already have gone pretty in depth with them on this blog in previous posts (see this Argan Oil post and Jojoba Oil post), and others have in guest posts (see Benefits of Argan Oil and 5 Unexpected Ways Oils Can Benefit Your Family). I also once interviewed the lovely Paul from Fresh Skin about the benefits of essential oils and have also posted some great DIY recipes for beauty products that you can make yourself at home. 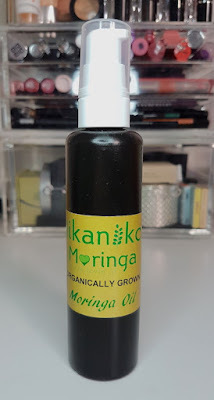 Today, however, I have a slightly different oil to share with you all that I haven’t yet covered: Moringa Oil. 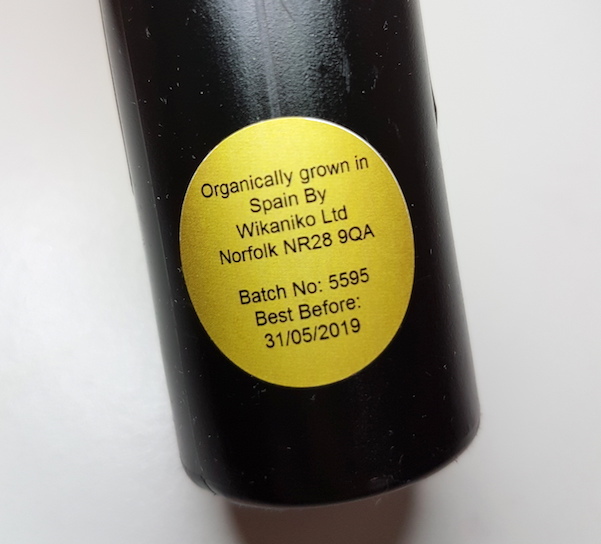 The particular brand of oil that I have to show you all is Wikaniko who pride themselves as the UK’s leading Moringa Oil providers, producing high quality oil by growing the moringa themselves on their Spanish moringa farm. This particular project also enables people to visit the farm, learn all about moringa and its benefits and to see how moringa is grown. In addition, you can purchase your own moringa tree and practice harvesting it and create different products, such as the oil and Moringa Powder, for your own personal use. It’s truly fascinating stuff, and if you’d like to find out more about it, you can do so here. The Wikaniko Moringa Oil itself though is said to be fantastic for a range of different things. You can use it on the skin (both on your body or your face), your hair, to treat eczema, blemishes, wrinkles, minor skin ailments and so on. You can also use it on your hair as either a treatment or a cleanser - sort of along the lines of coconut oil rather than argan oil. It comes bottled in a 100ml, brown plastic bottle with a white pump cap. In this post I’m going to be discussing the ways that I have been testing it out and the results that I’ve been having with it. So far, the ways that I have been using this oil include the following: as a body oil, face oil, on my daughters eczema, on the hair and on the cuticles. Use as a body oil I think is my personal favourite method of use. You can use it directly on dry skin or apply it to damp skin, which enables you to use a smaller amount as it spreads farther across the skin. It absorbs into the skin easily and quickly, and importantly it doesn’t leave any greasiness behind. When waiting a while after using some body oils, you can begin to feel the softness disappear and need to reapply. With this though, the hydration it provides is fantastic. Skin continues to feel soft and moisturised until you next use it. I particularly love using this after hair removal. My skin is very prone to irritation, but by using this oil directly after shaving, the skin is instantly soothed. If you have sensitive skin that is also prone to irritation, I do highly recommend trying this out. As a facial oil, this Moringa Oil is good for all skin types. Following on from what I just stated about it being good for preventing irritation, it is also particularly good at soothing any current irritation. This is also true for skin that may have blemish marks or redness on the face, too. Just like on the body, the oil absorbs easily onto the skin, but I think it depends on what skin type you have as to when during the day that you should use it. I have oily skin, and I found that using it during the day could cause my skin to be oilier and greasier during the day. However, using it at night is a great option. If you have normal or dry skin, you could use this during both the morning or the evening. In addition to helping to reduce redness and blemishes, the Moringa Oil is also good at helping to reduce wrinkles and improve firmness on the skin over time. As I don’t have mature skin yet, I can’t comment too much further on the results of use on wrinkles, but I can direct you to the Wikaniko website where the reviews of its use on wrinkles are glowing. Whilst on the topic of glowing, this oil will also help to provide those with drier skins to have a beautiful radiance. Just like on the body too, it helps to provide constant hydration to the skin. All of the benefits that I’ve listed so far is why I also think that this oil is particularly great on eczema. My daughter has nasty patches of eczema around her ankles, and it can not only be very dry but also very red and irritated. Even after just one use of this oil on these areas before bed showed a great improvement by morning, and there was also a sufficient decrease in the amount of itching on her behalf that I noticed too. On the cuticles I find that this oil works just as well as others, such as Argan and Jojoba at keeping them hydrated and looking neat. I rubbed any access into the nails and hands and this also works as a great hand and nail oil. Fantastic if you have dry hands, so also very suitable during the winter months. On the hair, I used this in two ways. Firstly, I tried it on wet hair before drying, and then on a separate day I used it as a pre-shampoo treatment. I usually avoid using oil on my hair before drying it as my hair can go greasy very quickly. It also tends to leave it looking oily, weighed down and, for the lack of a better word, “ugh”. So with this oil, I rubbed a very small amount on my hands first and then gently sort of played with the ends of my hair to disperse only the smallest amount throughout. Once dried, there was no greasiness, instead there was extra softness and shine that wasn’t there before. Because of this, I have to say that if you tend to avoid hair oils like myself for the same reasons, you should feel safe enough to give this one a try! I can’t pass judgement on how it behaves on drier hair as, like I’ve mentioned, my hair is of a different type, but I do really enjoy the life it provides to tresses. As a pre-shampoo treatment, I don’t think this worked as well as something such as Argan or Jojoba oil in regards to deep moisture. With that said, it did help to cleanse the hair well which makes me think that this could work well as a conditioner. It rinses out of the hair easier than the other aforementioned oils of Argan and Jojoba, so once again it reminds me more of coconut oil than those. Overall, I’m really enjoying incorporating this Moringa Oil into my routine. I think that if you are already a fan of using oils but haven’t tried this, it would be great to try alongside others. It has it’s pros and cons, but so do others. Where Argan Oil or Jojoba can be too heavy to use before drying fine hair that is prone to greasiness, Moringa adds softness and shine. On the flip side, as a more intense treatment, Argan and Jojoba do a better job. Combined though in one fuller routine? You’ll be flying. I’m already coming up with DIY recipes in my head for other ways to use this oil. Imagine a nice hair and body mist along with some essential oils, or as part of a body oil with other oils. That’s always the great thing about purchasing individual oils, they work great alone but together the possibilities are endless. 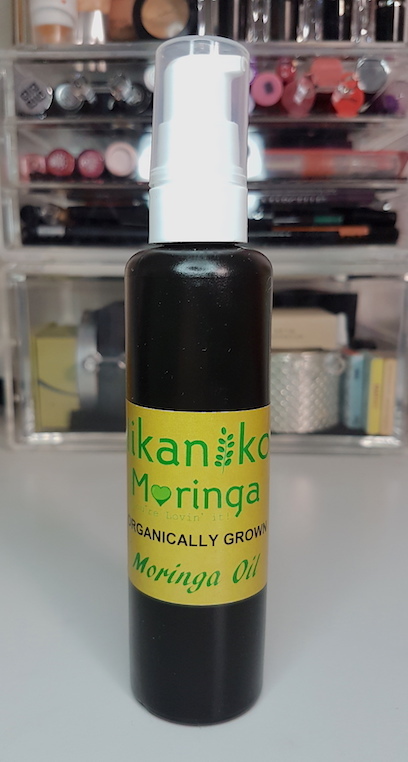 If you would like to purchase the Wikaniko Moringa Oil, you can find it at Wikaniko. And as an extra treat, readers of my blog can use the discount code MOR10 for 10% off! Hurrah! 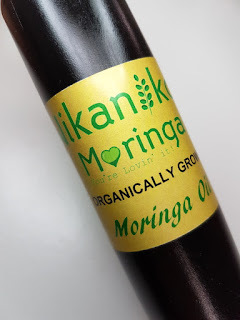 What are your thoughts on the Wikaniko Moringa Oil? What oil is your favourite? *This product was sent to me to sample as a review consideration. However, this hasn't in any way affected my review with all thoughts and feelings about the product and company being 100% my own.